Lower back pain is one of the most common disease condition prevalent in the 21st century. 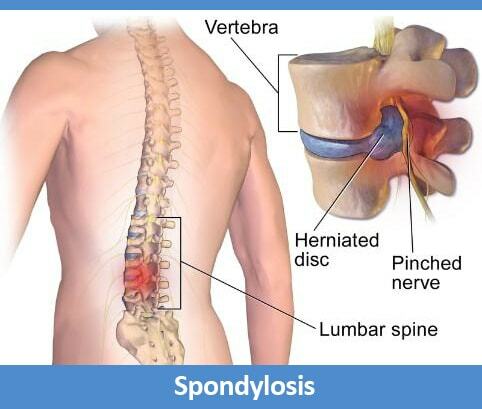 Also known as Spondylosis which is a broad term that simply refers to some type of degeneration in the spine. The Katti Basti begins with a lower back massage, the back is then wiped with warm water before a dough ring is placed on the lower back. It is applied to the lumbar-sacral area of the spine, which is a major site of Vata. The warm medicated oil is slowly poured or swabbed onto the lower back in the dough ring. When the oil cools down, it is squeezed out with cotton gauze and the procedure is repeated a few times. Katti Basti has a wide use for any pain, strain, or tension in lower or upper back. Most of the time, Vata dosha is the culprit in this area. An Ayurvedic explanation: In the subtle body, the nadis emerge from Manipura (navel) chakra and supply energy to the upper and lower extremities and back. To achieve a balanced state of body, mind, and consciousness, Ayurveda prescribes purificatory therapy Panchakarma for the cleansing of body toxins. Kati vasti, a part of the pre-operative procedure prior to Panchakarma is a very effective treatment for lower backache. The waist area of the body is called Kati. Holding warm ayurvedic oils on the affected areas is called Vasti. Kati Vasti involves retention of warm thick medicated oil over the lower back or other parts of the spine for a certain period. The patient is asked to lie face down on the bed and is applied medicated oil locally around the lumbosacral region. Then, a reservoir made of black gram dough is built around the lumbosacral area. Ensuring leak-proof, a lukewarm medicinal oil around 200-300ml is slowly poured into it. The temperature of the oil is maintained reheating and continuously adding more oil. The oil is kept on for 30-40 minutes. Once this part of the treatment is over, the affected area may be gently massaged, followed by a steaming for 10-15 minutes for better absorption of the medicine. It is usually done in a course of 5 to 7 days as required according to Ayurveda practitioner. Full body and localized message. It tones up the muscles and improves blood circulation. The stretching technique followed during massage acts as traction and helps to reduce stenosis by increasing intervertebral space. Thus, it reduces the nerve irritation. Fomentation by Patra Pinda Sweda, Bashpa Sweda, Nadisweda or Churnapindasweda. Sudation reduces pain and stiffness in ligaments, muscle spasm and improves blood circulation. Retention of oil on the lower back, which helps in replacement of hydration in the affected disc. 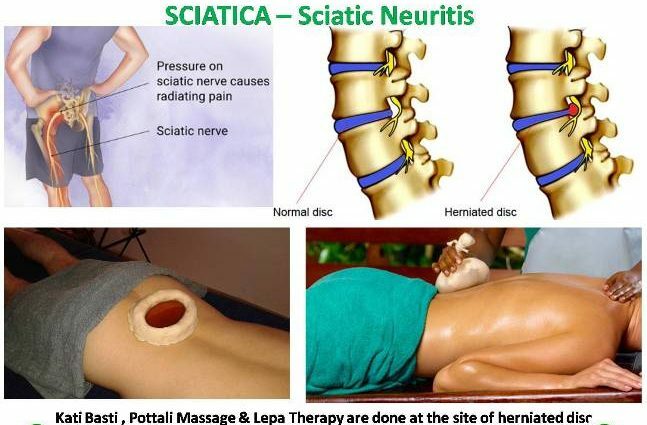 Pressure on the Sciatic Nerve causes radiating pain. Sciatica will affect around 40% of the population in their lifetime. Incidences increase with advancing age. Pain – radiating to one side, dull or sharp, burning, worsens on sitting. Difficulty in movements of legs & feet, Tingling & numbness, stiffness. Like the old saying “slow and steady wins the race”. So is Ayurveda’s strength in healing the body. All the therapies done during Panchakarma are safe, without any side effects and have long-lasting effects.